My first impression was, ‘wow, how did they let this get built?’ It seems shockingly unsafe for the city to let people wade into the pools, wander along the top edge, and generally treat it like the world’s quirkiest public pool; at one point there were two dozen people scattered throughout the pools, including kids who had showed up with swimming suits and towels. 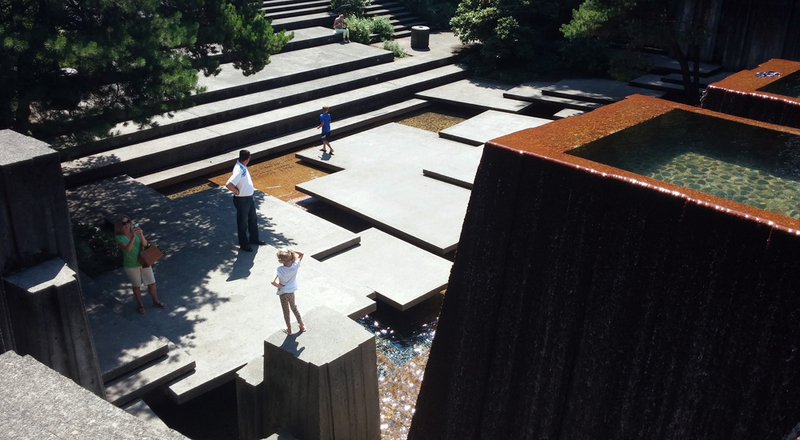 I give Halprin credit: it’s hard to imagine this was ever approved by the city’s lawyers but I’ve heard that it actually has a good safety record. Like an adventure playground, it looks so obviously dangerous that people treat it with the proper respect and avoid hurting themselves. I saw one woman absolutely traumatized by the sight of her young daughter venturing close to the edge, but, after screaming at her kid to get back, she didn’t actually make the girl get out, just stay away from the danger zone. It’s too bad that things like this are so rare in our built landscapes. 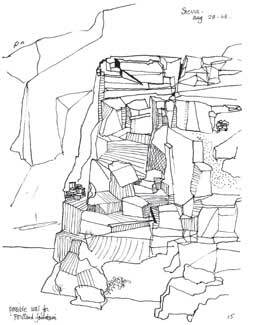 One of Halprin’s early design sketches for the project shows a granite cliff, though the design obviously evolved quite a bit beyond this starting point. 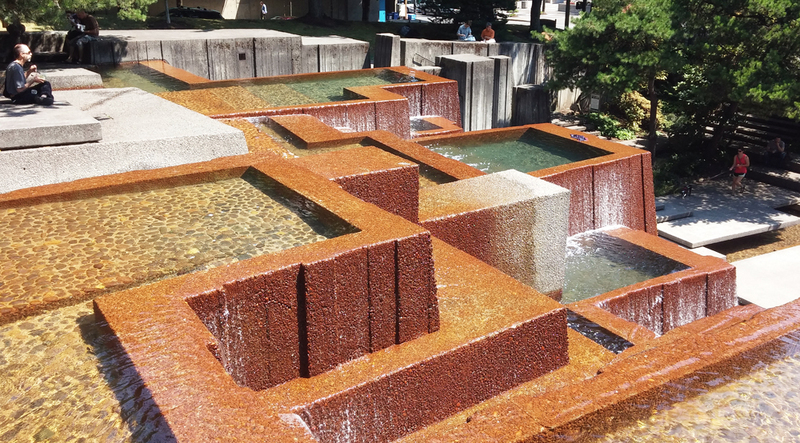 Instead of a granite cliff, the forms of the fountain remind me much more of a city skyline, like a bunch of high rises pushed up against each other. They were designed, after the initial concept sketches, by an architect on his staff, Angela Danadjieva, working with clay, a key difference that shows some of the differences between concrete and stone, and maybe even drawing versus using models. Stone is typically created by an additive or subtractive process; you carve material away or add stones together. Clay is typically molded; you can push it around in ways that are impossible when with stone. And concrete is more closely aligned with clay; you pour or cast concrete in a form, much like you pour bronze in a mold after building a model. Switching from stone to clay and concrete was a key decision and paradoxically one that made this such an important evocation of nature. 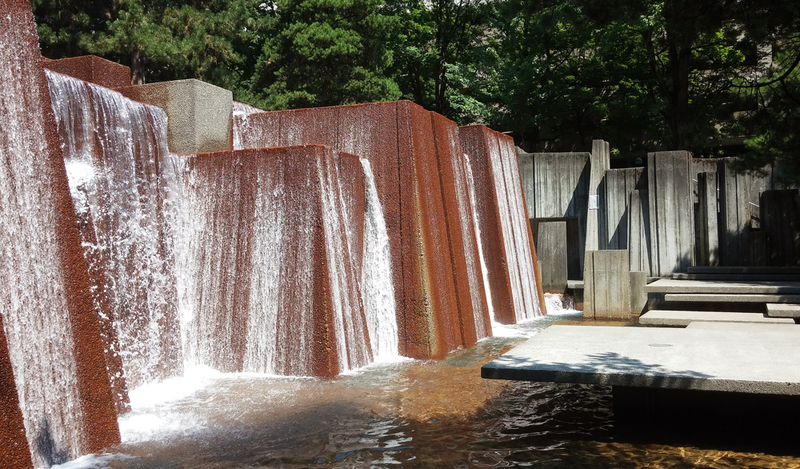 Because even though I said the forms remind me of a city skyline, even though the forms feel human-built and urban, the overall effect is impressively evocative of a natural waterfall, and actually one waterfall in particular, Nevada Falls in Yosemite Valley. 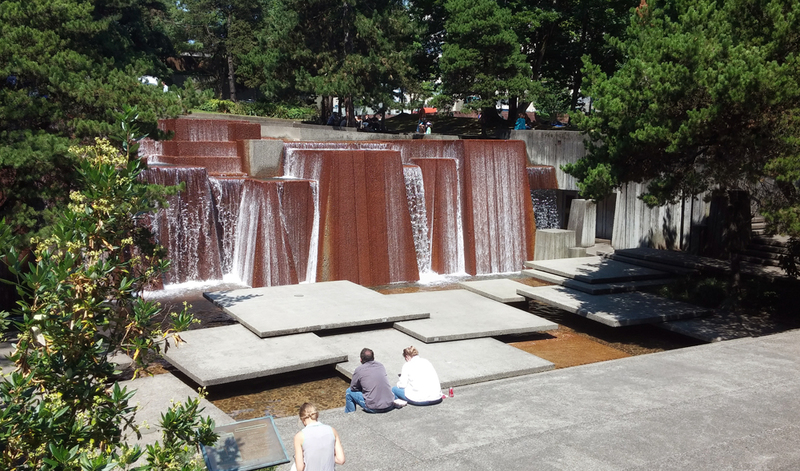 The two spaces don’t look anything like each other, but the experience of sitting above the Keller fountain is unmistakably like sitting above Nevada Falls. None of the surface elements are there — it’s concrete instead of granite, it’s more obviously geometric, it’s surrounded by a city — but the core experience is the same — the drifts of people, the rising mist, the roar of the water and the way it dominates the space. Pumping 13,000 gallons of water per minute will obviously go a long way towards creating the feel of a waterfall, but the effect was also created by the way people scatter themselves throughout the space, perching on the concrete walls, sitting at the edge of the water, and wading around in the pools above the cascade. I’ve heard that Nevada Falls was one of Halprin’s favorite places, and anyone who has ever been there will immediately recognize it when they see the Keller Fountain. It’s uncanny and really impressive. In the post for the Japanese Garden, I said I sometimes felt as if I were an actor hitting my marks, feeling that all of my movements had been designed or choreographed, and the Keller Fountain has a few spots that feel like that, such as the plinth in the photo above, clearly designed as a place for people to pose in photos (a lot like the row of statues designed for visitors at Halprin’s Roosevelt Memorial in Washington DC to pose as the next statue in line, a nice participatory element in that memorial). 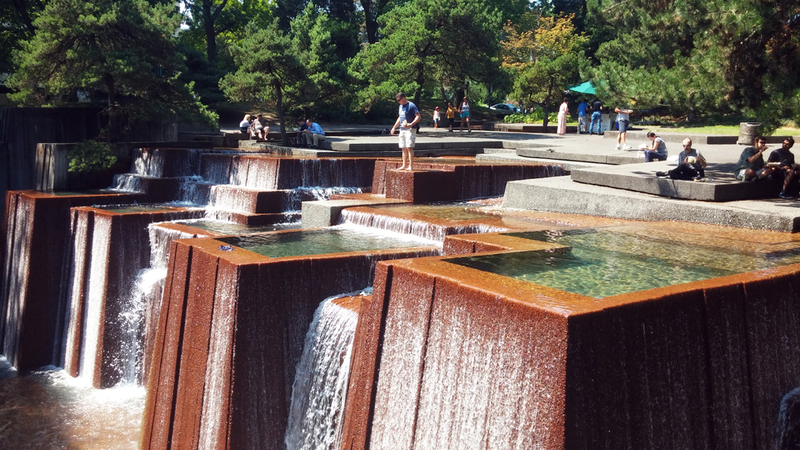 But most of the fountain felt like a ‘choose your own adventure’ kind of space, and if you look on google images, it’s amazing the way everyone is doing something different in every photo. There’s an impressive variety of poses and images for such a small urban space. It’s a living space, incredibly dynamic. I’ve heard this can look rather brutalist on an overcast winter day with the fountain turned off, but actually it looks pretty good in photos and the bare articulation of the masses really appeals to the stone guy in me. This entry was posted on Sunday, September 14th, 2014 at 2:30 pm and is filed under public gardens. You can follow any responses to this entry through the RSS 2.0 feed. You can leave a response, or trackback from your own site.